This month, Los Angeles local school board members received a 174 percent raise in their salaries, from $45,637 to $125,000 per year. Members who receive a second salary or stipend from another organization will receive $50,000 per year, nearly double their previous annual salary of $26,437. In comparison, the starting salary for a teacher in the LA Unified School District (LAUSD) is just over $50,000, while City Council members made $191,616 last year. Moving beyond the initial shock of a 174 percent raise for public officials, the recent raise for LAUSD board members prompts important questions about how school board members are compensated—not just in LA, but nationally as well. We explore some of these questions here. First, note that the school board did not give itself a raise. The independent LAUSD Board of Education Compensation Review Committee, comprised of members appointed by local leaders, reviews the board member salaries and benefits every five years. When last evaluated in 2012, amidst the recession, board member salaries remained flat. Board members, in recent testimony to the committee, reported working many more than 40 hours a week and struggling to manage second jobs on top of their board responsibilities. The Board of Education determines the school calendar, sets the budget, oversees curriculum and instruction to achieve educational equity, authorizes new charter schools, and maintains the health and safety of the district’s more than 650,000 K-12 students. Certainly, the extent and type of school board responsibilities vary across the nation’s roughly 14,000 districts, and LAUSD board members may spend many more hours working than the average school board member. Consider, for example, that a 2010 survey of 900 board members from 418 different districts nationwide found that almost 40 percent of board members in districts with at least 15,000 enrolled students reported working more than 40 hours per month, or more than 10 hours per week. Of the 20 largest districts, school board members in six districts receive no compensation at all in. In Texas, which contains two of these six uncompensated districts–Houston and Dallas—state law prohibits school board members from receiving compensation for their service. In the other four uncompensated districts, board members are appointed, not elected. 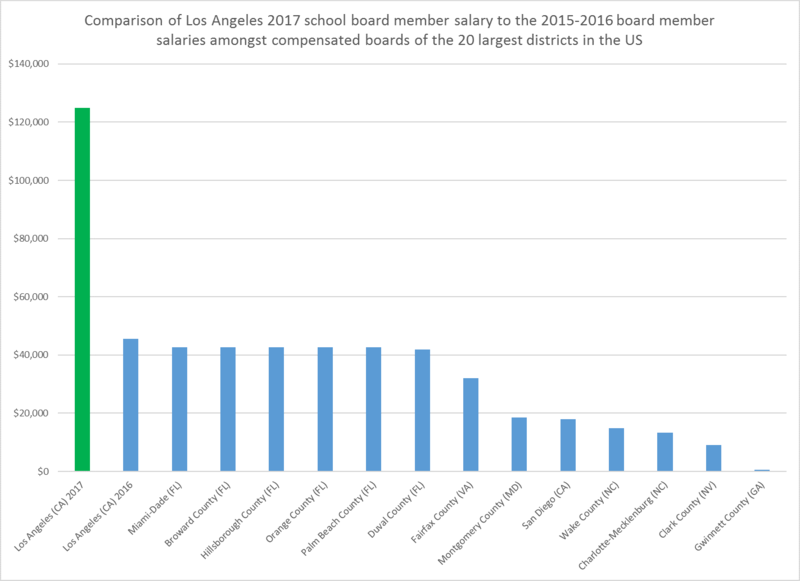 The figure below illustrates how salaries for LAUSD board members compared to salaries in the other 13 paid districts in 2016. We also include a bar that indicates the new 2017 salary for LAUSD, for the sake of comparison. As the figure shows, in 2016, LA school board members were the highest paid of this group, but were not obvious outliers. Among these 14 districts, including LA, the average board member salary in 2016 was $29,066. Under their new salary raise, LAUSD board members will make more than four times this amount. Note: Gwinnett County (GA) school board members received $600 in 2015-2016 salary. | Sources: Various state and district board websites, as well as The Charlotte Observer, Greensboro News & Record, The Washington Post, and Southern California Public Radio. For another angle of comparison, consider the following findings from the same 2010 survey: “Nationally, 62.3 percent of board members report that they receive no salary, while 14.3 percent receive an annual salary of $5,000 or more and 2 percent earn a salary of more than $15,000 per year.” The same report found that the majority of board members in large districts receive a salary, but only 7.8 percent of respondents from large districts earned over $15,000 a year for their service. At first glance, it may seem that the LAUSD raises are outrageous–after all, the new salaries of these board members dwarf those of their peers in other large districts, who presumably are tackling similarly thorny, pressing issues as the LAUSD Board. Not to mention that, according to the survey, the majority of board members across the country receive no salary at all. Time to reconsider school board compensation? But, could it be the case that LAUSD board members are appropriately compensated, while others are vastly underpaid? Let’s entertain this possibility for a moment. A typical justification for paying school board members nothing, or very little, is that this position constitutes volunteer public service, or at the most, a part-time position. Historically, this may have been true of many districts, large and small. However, according to testimony from LAUSD board members, managing the second-largest school district in the country is not a part-time job. It seems possible that other board members across the country, especially those in large, urban districts, may similarly find themselves working long hours for little pay. Indeed, with the growing thicket of federal education reforms over the past 30 years, school board members have most likely seen their responsibilities increase substantially. If this is the case, at least in some districts, there are clear downsides to under-paying these public servants. The lack of pay (or minimal pay) may mean that only those who have the means to support themselves otherwise have the time and financial resources to serve in this position. If so, the pay structure of local districts may be a barrier to entry for lower-income individuals, with clear implications for minority group representation. Nonexistent or uncompetitive pay may mean that many well-qualified individuals never consider this type of position, choosing instead careers where their skills will be adequately compensated. Many have raised this concern about our teacher workforce, of course–it is entirely possible that a similar problem may characterize the school board workforce, so to speak. Further, if school board members receive part-time pay for what amounts to a full-time position, members who hold additional part-time jobs to make ends meet may not have enough hours in the day to carry out all of their school board obligations. Testimony to the LA committee bears out this reasoning, with one former board member asserting that her board work suffered–she could not attend meetings or visit schools during normal business hours–when she held a second job. Consideration of the recent raise for LAUSD school board members points to important issues that merit further investigation, not only in large districts, but in small- and medium-sized districts as well. LAUSD may be an outlier in terms of the number of hours that board members work and the scope of their responsibilities. At the same time, the recent raise in LA provides an opportunity to ask important questions. Should communities assume that school board members are volunteers or part-time employees? Do the number of hours worked and their current responsibilities justify this assumption? If not, it is worth assessing whether this pay structure is damaging the diversity and quality of local school boards by keeping out talented individuals who pursue other opportunities that offer adequate compensation. Sarah Novicoff contributed to this post.